We print thousands of forms every week for schools and nurseries around the UK. 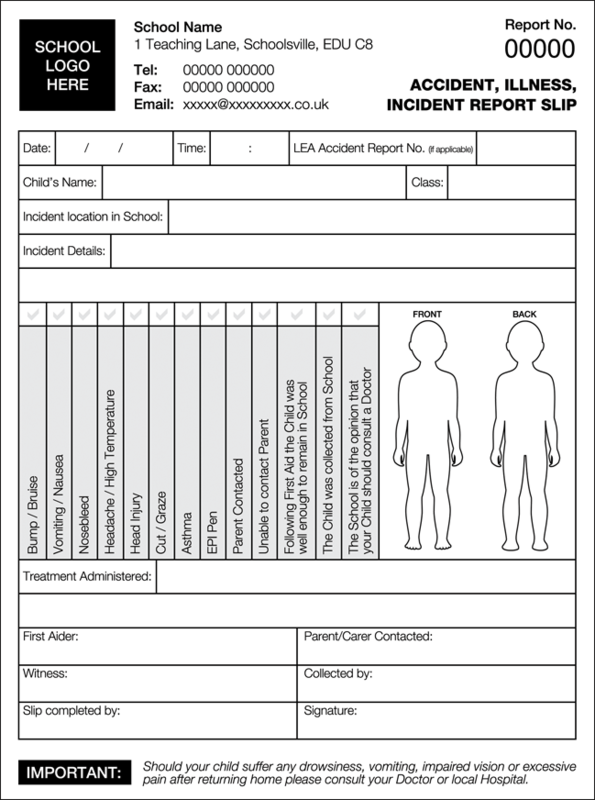 Our forms are perfect for recording accidents, incidents, illness and injuries and provide instant copies of the original document. Our forms can be supplied glued into pads, as books which are stapled, spine taped and perforated or as loose glued sets. We offer 2 part, 3 part and 4 part sets with 2 part being the most popular; offering a copy for the school and usually a copy for the parent/carer. The template on this page can be personalised with your school's details or we can design a bespoke form for you. Alternatively, you may wish to provide your own design for us to print. Our forms can also be adapted for use in the workplace if required.